Sulfur/brimstone balls from the ashen remains of Sodom and Gomorrah. The area of Djoser's pyramid complex believed to be the remains of Joseph's grain distribution bins used during the 7 year famine. How the Egyptians may have built the pyramids. A chamber at the end of a maze of tunnels under Jerusalem containing artifacts from Solomon's Temple (including the Ark of the Covenant). Christ's blood, dripped onto the Mercy seat of the Ark of the Covenant beneath the Crucifixion site. Below, Dr. David Kim corroborates Ron Wyatt's discovery in Mount Sinai in Saudi Arabia and location of the Red Sea crossing. Not surprisingly, Ron Wyatt has his share of skeptics, and while there may be some dispute over a couple of his findings, it is ridiculous to dismiss the entire body of his work over them since his findings match identically to the biblical accounts. The sheer fact that he, being a very righteous man who never made any efforts to profit from his discoveries and in fact sacrificed all his possessions and earnings to prove the historicity of God's works proved to me that he was specifically chosen by God to reveal them to the world. He, more than any one I have ever known, made me a firm believer of the bible accounts of the Old Testament. For that reason, I am eternally grateful to this man and honored to showcase his finds and be a part of his efforts to touch the lives of others to the reality of the Father's existence which I did by helping to broker the Chinese translation of his videos for the Asian market. An invitation to the author to explore for the lost Ark of the Covenant later arose from Richard Rives, the Director of the Wyatt Museum. 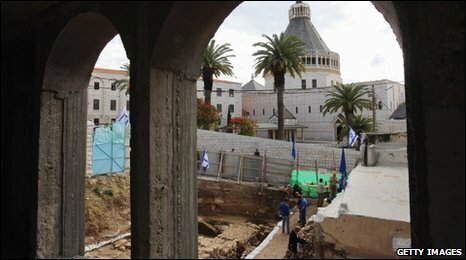 JERUSALEM – Israeli archaeologists have discovered a 2,700-year-old seal that bears the inscription "Bethlehem," the Israel Antiquities Authority announced Wednesday, in what experts believe to be the oldest artifact with the name of Jesus' traditional birthplace.The tiny clay seal's existence and age provide vivid evidence that Bethlehem was not just the name of a fabled biblical town, but also a bustling place of trade linked to the nearby city of Jerusalem, archaeologists said.